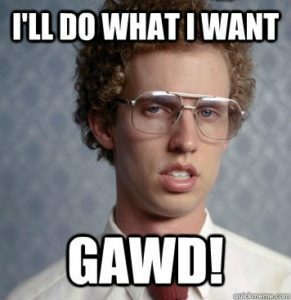 Unlike Napoleon Dynamite, Massachusetts does not in fact allow you to do what you want with your auto policy. Today’s blog post is the first in a series of four blogs covering “Compulsory Coverages”, or coverages Massachusetts requires you to have before you can legally drive your vehicle on the road. The first of those coverages is Bodily Injury Coverage. This means that you must have a $20,000/$40,000 coverage limit, specifically designated to cover injuries suffered by others if you get into an accident. $20,000/$40,000 specifically means that each injured individual can receive a maximum payout of $20,000 as a result of injury caused by the accident, and your policy will cover a maximum of $40,000 in total damages to all injuries from the accident. How does this work in practice though? Lets say for example you get into an accident and three people are injured. Person 1 will only receive $20,000 from the insurance company because there is a $20,000 limit per person. Person 2 will receive the full amount of $11,000. At this point the insurance company has already paid out $31,000, so they will only be able to give Person 3 $9,000 because the total limit for the accident is $40,000. With the compulsory coverage, you would be responsible for $6,000 out of pocket in this situation. It is also important to note that you can increase your coverage to avoid paying out of pocket costs as well! This is called Optional BI, which we will talk about in a later blog post! Optional BI will cover you when you drive out of state—if you get into an accident outside of Massachusetts and you only have Compulsory coverage and you pay all BI costs out of pocket!